Our USP - we are a British company with project finance, we do the planning permission, we design the plant, we build it, we operate and maintain the plant - our farmers supply the feedstock. Our Planning team is led by Jane Stewart who has been working with Qila since 2013. Jane and her team manage the entire planning and consultation process to facilitate successful planning approval for new projects as well as consented projects where changes are required. The latter can be more challenging than new sites as there are limitations on what is allowed, without having to reapply for a new consent or that may incur a lengthy delay. Jane and her team continue to work tirelessly to ensure planning goes smoothly and tight deadlines are hit. As a result of this hard work, Jane and her team have managed to submit and get successfull planning across 8 applications within the last 12 months. Our in-house Project Finance Team has successfully funded 18 plants to date and raised just shy of £200 million from investors wanting to provide project finance for the biogas or biomethane plants. We are the Design, Engineering, Procurement and Construction team - we design every biogas and biomethane plant ourselves in house with our team of civil, mechanical, electrical and process engineers. Our plants typically include a Turbo Tank that is heated to encourage the hydrolysis phase of biogas production to happen faster and more efficiently, thereby producing up to 30% more methane from a given tonne of feedstock compared to single stage plants that just have a digester tank. How Does a Qila Energy Biomethane Gas to Grid Plant Work? As the Engineering, Procurement and Construction (EPC) Team, we design the plant and project manage the entire tendering and construction phase. 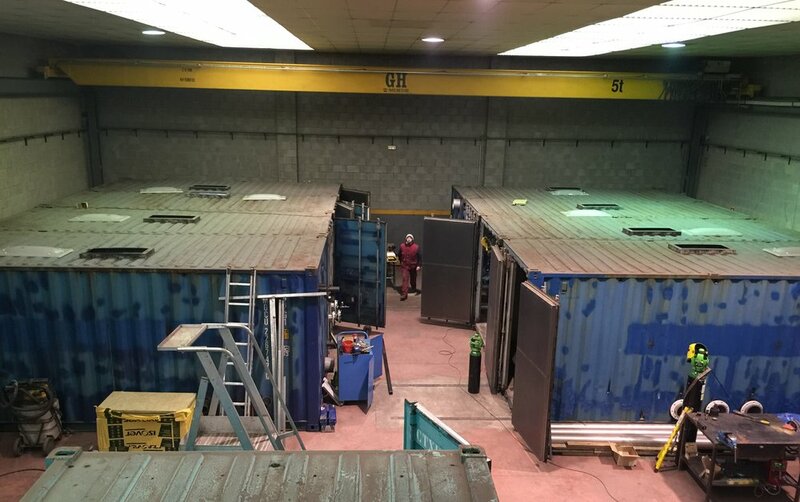 We manage the delivery programme, the commissioning, performance test and final snagging before the plant is handed over the the Operations Team. We maintain a strict Health & Safety approach on site with all contractors and carry out our own spot checks and third party technical adviser checks. Qila’s construction teams work to tender civils, mechanical and electrical work streams and oversee the entire construction and commissioning process. This team is led by Nik Codd, our Head of Construction. The numerous plants that Qila are constructing and commissioning up and down the UK, has led Qila to expand their team and assign an expert site manager for each construction site. These site managers continually work hard to ensure our construction milestones are met on time and Qila’s plants are built to the highest standards. During the development of Qila’s plants, our construction team are not tied to one supplier and as every project has unique, individual needs, this allows Qila to identify which suppliers best suit each project whilst simultaneously providing local jobs. The immediate availability of having a project manager on each site ensures that any problems the team may run into can be immediately resolved, giving Qila’s farmers peace of mind. Our project managers ensure that our staff adhere to high levels of safety on site, and will draw up a biogas safety plan that works to all Construction Design and Management (CDM) and Health and Safety (HSE) Regulations. In 2016 we installed our own biological testing laboratory based out of our Newark office. Here, we monitor the quality of feedstock and biomethane as well as offering several biogas laboratory testing services for unusual substrate digestion designs confirmation or to perform digester troubleshooting. This enables Qila to act quickly to any biological issues across all our UK plants. Our extensive Operations and Maintenance experience comes from own portfolio of plants that range from 250kWh, 499kWh, 1MWe, and 450m3 biomethane plants. Operations runs from the very beginning to the penultimate stage of the plants life, by far the longest period in the life cycle with no boundaries on performance or duration. Maintenance is a fundamental part of effective operations. Good maintenance improves reliability and extends operational life. At the heart of our service is the training and supply of competent, skilled manpower. Our extensive understanding of biogas and biomethane plants and their requirements, puts us at the leading edge of operational delivery. We add greater value by taking on more responsibility. As Investors require increasing accountability from us, we take complete ownership for operating and maintaining the plants, taking the initiative to meet delivery targets more efficiently. Strong performance underpins our reputation in Operations and Maintenance and we aim to provide complete assurance to our investors that their asset is receiving the best care. Safety is our foremost concern. We design safety in up front with our procedures, build it into our deliverables and ensure it gets the highest priority throughout execution. The greatest assurance we can deliver is to keep our Operators and Team safe.